My firstborn son is about to turn 16. And I asked him what he'd like. The conversation didn't go how I expected at all. Initially this seemed very strange to me, because what teenager doesn't want to ask for a free something or other for their birthday? 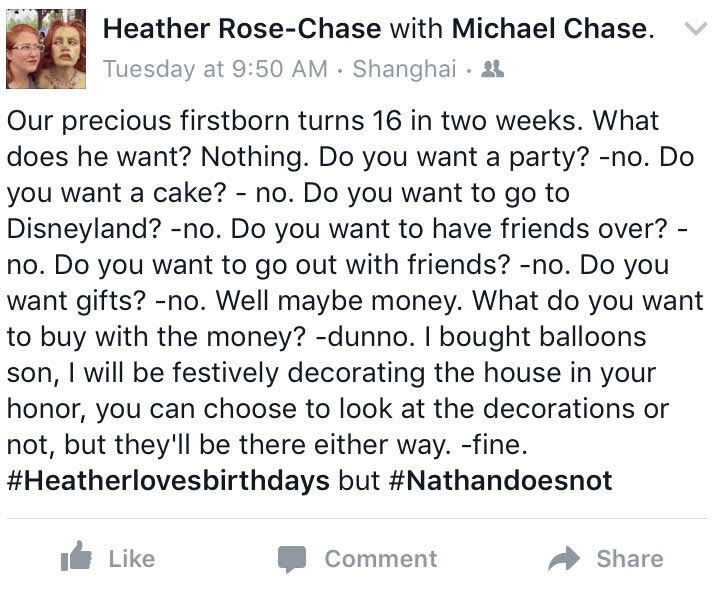 And the cake part was perplexing to my friends after I posted this, asking what teenage boy doesn't want cake?! Mine, apparently. We dug a well for water, and used diesel generators for electricity a few hours at night and in the morning. It was not at all a wonderful experience for me. When it would rain, the unpaved dirt road leading to our property would become impassable. 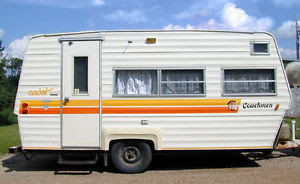 The trailers had the capability to heat water for a 4-5 minute shower, which was not nearly enough for a teenage girl with waist-long hair (the MO was turn on the water to get wet, turn it off while soaping and shampooing up, turn it on again to rinse and turn it off when the warm water abruptly ended. I never got better at it or made it a lifestyle). Not to mention sharing such a tiny space with my little brother at the peak of teen mood swings and sibling rivalry (okay, sibling war). I have plenty of stories, but when I dwell too much on this time period, I plunge into angst and moodiness even now. Let's just say that when we finally completed construction on the house and were able to move into actual bedrooms with actual beds and showers that could run hot water for nearly an hour instead of minutes, it was a definite uptick for my hair, my general hygiene, and my over all high school experience. Living in the house wasn't without challenges however. We still lived in the middle of forty acres at the end of a three mile dirt road. In warm weather, rattlesnakes would wander into our garage (and once into our dryer!). In cool weather wild boars (and sometimes hunters) would wander the property. Cows regularly barged through and were the source of much stress (and a story for another day). In wet weather the road was still impassable except for the one 4WD truck we owned, meaning I walked that dirt road in mud-ruined shoes more than once (and generally while angry, indignant teenage tears streaked my face along with the rain). And in freezing weather, the pipes which ran uphill from our well into our house would freeze, stopping the flow to the showers and toilets and sinks altogether. We got better at mitigating this, but that first winter, just a couple months after moving into the house, was a nightmare. I was about to turn sixteen on Christmas Eve and a sophomore in high school. The previous Christmas break we'd spent in Southern California at The Disneyland Resort, because a Christmas in tiny trailers on a dirt lot was too depressing even for my parents. But the first Christmas in the new house seemed like something to celebrate, so we had no plans to leave. California's Central Coast freezes each year but it doesn't snow, and that year was no exception. It was a particularly brutal cold snap that hit Monterey County and froze our pipes solid the week before my birthday and Christmas. I was sad the first day the water froze solid, as we had to flush the toilet using a bucket of store-bought water. The second day I was feeling hopeful that somehow my mom and dad's hard work of wrapping the exposed pipes coming from the well before heading underground would somehow be enough, despite the forecast of even lower temps the following day. The third day I was grateful that it was Christmas break and that no one would see me in my shockingly unshowered state, but felt worse for my parents who were digging up some of the pipe to wrap it with insulation, and were downright dirty. The fourth and fifth day I was tearful, sinking into the blues, curled in my bed with a book and refusing to get dressed (why bother getting any other clothes dirty?). The sixth day I was begging my parents to somehow pull off a birthday miracle for the seventh day, and make, find, beg, steal, or borrow me a shower so I could wash my oily hair and smelly teenage body. I would give up any and all other birthday gifts for my sweet sixteen birthday if I could just have a hot running shower. Six days with no shower, just a lukewarm wet washcloth to dab at the places that rub together when you walk, is a terrible place to be when you are fifteen, about to turn 16. My thick hair that was long enough to sit on was limp with grease. My body odor was barely masked by the cheap aerosol "Designer Impostors" cologne which knocked off name brand perfumes popular in the early 90's. My brother, one year and one week younger than me, fared no better in the smell department, but as I was no longer sharing a small trailer with him, I didn't care as long as he stayed in his room and I stayed in mine. My parents, who were doing sweaty, dirty, physical work outside in the cold were surely more in need of a shower than I was, but 15-going-on-16 year old American girls aren't necessarily known for caring more about their parent's physical appearances than their own, unless they somehow show up in public and embarrass you. And the middle of forty acres of land at the end of a three mile dirt road was not really "public" so they got a pass and I could fully dwell on my own dramatic, angst-filled, deteriorating state. Our nearest neighbor was about two miles away, on a branch off from the start of our three mile dirt road. It was my high school principal and his wife, empty-nesters with grown children living elsewhere. Their house was at the top of a hill overlooking our valley, a huge imposing house which looked better suited for an architectural magazine cover than a tiny rural town. Let's be honest here, no one really wants to be neighbors with one's high school principal. But when you live in the middle of nowhere, it's important to be friendly, if not close, with your neighbors. And my parents, on the eve of my sixteenth birthday, boldly called up my principal, explained that we were now in day six, soon to be day seven of no water, and asked if they would grant my birthday wish of allowing me to use their bathroom to take a shower the following morning. And of course, no matter what I might have thought about him previously, he turned out not to be a monster and said OF COURSE. So the morning of my sixteenth birthday, Christmas Eve to the rest of the world, my parents drove me up the hill armed with a towel, a bar of soap, shampoo, conditioner, and a change of clothes, and gave me one of the best birthday presents I've ever received. The principal and his wife offered for the whole family to take showers, but my brother evidently declined, and my parents were content to sit in the kitchen drinking coffee with Mr. Principal and his wife, while I was given free reign of the master bathroom and the most advanced, luxurious shower I've ever encountered anywhere in this world to this very day. First of all, it was huge. Bigger than any I've ever seen before. Take an average pretty big master bathroom and make the whole thing into a tiled shower room. Second, it had three different ways to shower. There were two rainfall-style overhead shower heads that could be operated individually or in tandem with a shower buddy. There were two high powered massaging shower heads coming from two sides of the shower. And then there were nozzles coming straight from three of the walls, car-wash style, which would spray water from shoulders to ankles. Third, the bathroom had in-floor radiant heating, meaning my bare feet were not freezing on the tiled floors, they were warm and toasty. I was in awe of the luxury. I tried every shower head device, and then simply used them all at once. After a week of freezing weather and no shower, it was heavenly. I soaped up over and over again, scrubbing away my dry, flaky skin on my body and the shiny, oily skin from my face, shampooed and rinsed my greasy hair three times before finally getting a lather, and then just stood in the endless hot water until my sudden guilt over using someone else's shower while my parents patiently waited made me turn off each shower head, one by one. I combed and braided my wet hair and got dressed in clean clothes and could not wipe the smile off my face. I'm smiling now as I think about it. I have never been so clean in my life! We returned home and collected my brother, and then drove the 30 minutes south into town to eat a birthday dinner at a fancy, dimly lit, Italian restaurant in Paso Robles. I remember the jokes about the dim lighting being a good thing because of the state of my parents and brother, but I had only gratitude, not embarrassment. I don't remember if I actually had any gifts to open that evening after the waiters and my parents sang Happy Birthday to me over a candlelit tiramisu, but I will never, ever forget that amazing shower. Christmas came the next day, bringing with it slightly warmer weather and enough thawing water to finally flush toilets via the modern magical way, and quick showers for my brother and parents in our own house. I don't remember any gifts we got that year, but I do remember we laughed a lot. This story reminds me of those saccharine sweet sayings we spout when someone goes through a rough time... about not appreciating the light until you've been in the dark and so on. As a young teenager, I had absolutely no appreciation for things like leisurely showers, normally flushing toilets, and private bedrooms with doors that close until I'd spent time without those things. So I guess I can look at my own son and his lack of desire for anything specific, or anything at all, for his own upcoming birthday and feel some joy that he is content in his life with what he already has. I'm just hoping that he doesn't have some secret wish that he'll reluctantly share the night before his birthday... Otherwise he's just getting cash. Cash and balloons. 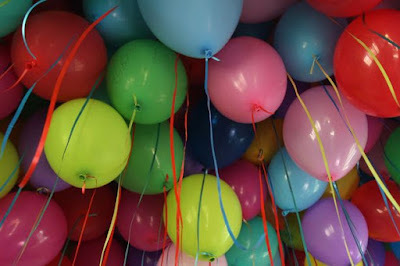 Lots of balloons. 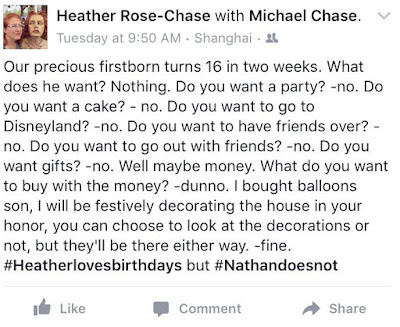 Because #Heatherlovesbirthdays even if #Nathandoesnot. Oh Heather.. your life is meant to be a story! A wonderful sometimes hilarious story to be told to all!! Yes in these fancy high tech times sometimes we take the little things for granted like hot water. Such a necessity in life I would say. Of course Mr & Mrs Principal's house sounded like heaven on earth! Wow! Emily turned 16 and she too did not want anything for her birthday. While a friend of mine planned a ballroom shin-dig (those sweet sixteen parties are like mini weddings now and days) my daughter wanted literally nothing. It's no big deal she says. Well it was no big deal when I was 16 (I don't remember doing anything special) but I was determined to have something special for her so I 'forced' her to invite some girl friends to a movie, dinner and dessert. It was so nice to see her old friends from elementary school. And she got balloons from a friend at school. So some things are the same. Happy 16th Birthday Nathan! !Know you are loved deeply by your dear Mama! !